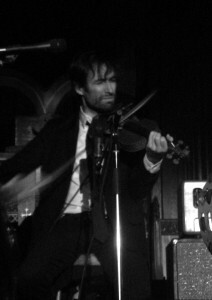 It’s easy to forget that Andrew Bird’s a classically trained violinist. The sometimes nonsense-lyrics, the eccentric personality, the giant speaker horns that dwarf him on stage, the usage of layers of sound and looping pedals, the fact that his last name is Bird and he whistles – all serve as plenty of conversation fodder when talking about him. People talk about the time he dropped his violin and it snapped in half earlier this year, they talk about the early days of his career, when you could still catch him at the Hideout, they share stories of awkward after-show encounters with him, and, yeah, okay, some people talk about how pretty he is. But what a lot of people don’t talk about is just how good he is on a technical level. When you strip away the band and the quirky-indie-rock-star image that he’s not even gunning for, when you take away the lyrics and occasional bombast of performance and just let his technique stand for itself, you remember: this man could have easily made a career as a top-notch orchestral musician, sitting on the stage of Symphony Hall and playing with the CSO. Instead, he’s chosen to follow his heart, making music that draws just as much from classical tradition as it does from jazz, folk, or even nature itself. Over the past four nights, even with the looping pedals and the giant speaker horns and the rambling introductions to songs, Bird’s classical heritage was on display more than ever. Andrew Bird set out to create a series of shows where the main objective was comfort. 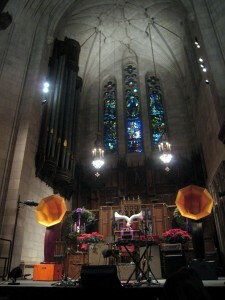 Inspired by performing in churches at holiday time during his childhood, the so-called Gezellegheid concerts — roughly translated from Dutch to “cozy” — were a chance for Bird to be a little more self-indulgent, playing more freely-formed instrumental pieces, unburdened by concept, as he put it on the final night of the residency. The night’s setlists were populated with a few songs still in formation, a few songs taken back to the time of their birth, and a few familiar songs that are still being reworked. There wouldn’t be the fiery passion of “Why?” or the joyful apocalypse of “Tables and Chairs”, but that was okay. While Bird’s performances were captivating, I found myself to be, well, relaxed, not feeling so caught up in remembering every last detail and more content to let my attention wander, imagination inspired by the lush sonic landscapes that one solitary man was creating in front of me. Comfort. Some particular song related highlights for me included the new version of “Section 8 City” (which has taken some the lyrics from “Take Courage”, a perky bonus track to Noble Beast, and slowed the whole thing down, among other changes), his cover of Cass McCombs’ “Meet Me Here at Dawn”, and the new song titled “Oh Baltimore”, which has lyrics that are too bizarre to share at this point, Bird said. The melody is pretty catchy, however, so I’m hoping that he eventually deems the words fit to share with the public. Also fascinating are the few little glimpses we get into the way Bird’s mind works when it comes to songwriting and inspiration for his works. He’s admitted in the past that oftentimes, he doesn’t know what a song means until some time after he’s written it. At Wednesday’s show, he shared with the audience that a conversation with a family friend helped him find some insight into “Fitz & the Dizzyspells”. While he’d originally written it while thinking about things like night terrors (after he awoke after a night in a hotel room to find a note slipped under the door saying “you woke me up”, when he had no recollection of making any noise the previous night, and so wound up wondering if he’d had some unknown sleeping freak-out), the friend asked if the song was about Bird’s brother, who is autistic. No more explanation than that was given, or even necessary, really (especially if you’re familiar with the lyrics), but it was a stunningly personal moment coming from someone who still manages to maintain a level of mystery around himself. I don’t think I’ll ever get tired of sitting through an Andrew Bird show. I had a few people ask me how I managed to not get bored after watching the same thing (sort of) each night. Taking aside the fact that I’ve been known to listen to one song on repeat for several days, the simple fact is that every night, there was something new to discover, despite the similar setlists. And that’s what draws me to Andrew Bird’s music, the fact that even the most pared down pieces are still full of the unexpected. Years after first hearing The Mysterious Production of Eggs, for example, and I’m still finding new things that intrigue me about the songs. The new melodies and songs in their infancy that Bird played during these four shows will undoubtedly provide new material to discover and rediscover for a long while. My photos from three of the four nights (photography on the fourth night was scuttled by pesky security personnel) is available at Flickr, and my video of “Oh Sister” is up at Youtube. In case you’ve missed it, I’ve posted setlists and some amusing tidbits for Monday, Tuesday, and Wednseday. Thursday’s setlist is after the jump. Excellent review. I think you understand Mr Bird and the Birdverse as well as anyone not in direct contact with him. I am surprised that he did so much of the same material but that would not have mattered to me either. It’s never quite the same. Also, I heard elsewhere that the new Section 8 City / Take Courage is something to behold. I wish I could have been there. Thank you so much. Thanks you for this great review. One of the reasons I love your reviews is how they articulate the reasons why I (also most people I guess) love him, reasons I seem to know but don’t know how to say. What he revealed about “Fitz and the Dizzyspells” is indeed stunning personal, just how forthcoming can he get? I still don’t feel I comprehend it…completely. I guess people never do with Bird. A good review you wrote, as well! I almost used that same quote from Thursday, “unburdened by concepts.” Were you the photographer who met my photographer, Andrew from St. Louis?